Written by Afsheen Sharifzadeh, a graduate of Tufts University focusing on Iran and the Caucasus. Part of this narrative stems from the author’s visits to Armenia and the Tehrani Armenian community between 2014-5. 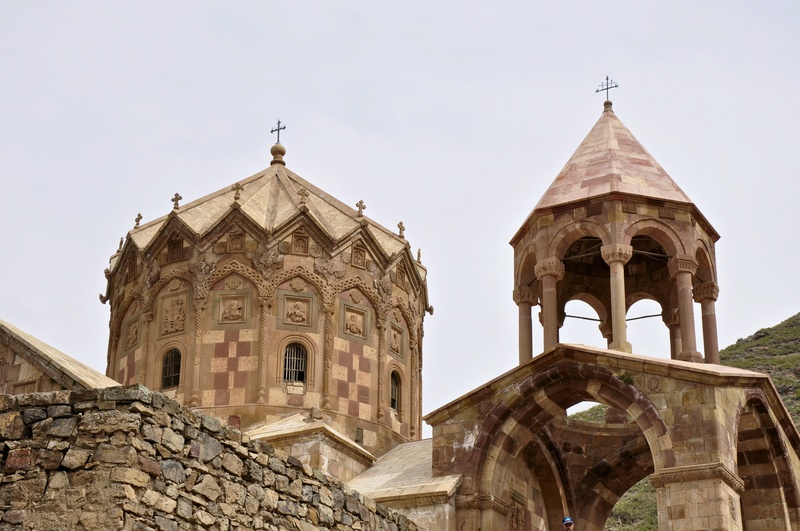 The goal of this article is to familiarize the reader with the Christian Armenian community of the Islamic Republic of Iran, with a focus on its culture and language in a historical and modern setting. Armenian (self-designated Հայերեն Hayeren) is an eccentric, satem member of Indo-European and occupies its own clade within that family. Of note, it does not belong to Indo-Iranian or Balto-Slavic. Without any immediate sisters, Armenian is joined by Greek and Albanian as an extant isolate within the Indo-European family. Modern Armenian constitutes a pluricentric language with two standardized forms. The main typological split is between Eastern Armenian (Արևելահայերեն Arevelahayeren)—derived from the language of the 18th century Russified Armenian intelligentsia (Հայ մտավորականություն Hay mtavorakanut’yun) centered in Tiflis—and Western Armenian (Արևմտահայերեն Arevmtahayeren), the contemporaneous language of the Ottoman Armenian elite centered in Constantinople. These two standardized forms represent poles in a spectrum comprised of various intergrading dialects that once spanned a putative homeland from Sivas to Baku, disregarding the historical Armenian diaspora (Սփյուռք Sp’yurrk’) which at its height reached as far as London and Java. Until the 19th century, Armenian constituted a diglossia whereby literature was composed in the archaic, otherwise unintelligible Classical Armenian language (Գրաբար Grabar)—now limited to liturgy—while the spoken languages (Աշխարհաբար Ashkharhabar) belonged to the Eastern and Western varieties detailed above. The two spoken varieties are only moderately mutually intelligible without training. The Armenian varieties encountered in Iran belong to the Eastern subgroup, as do the dialects of Georgia, Nagorno-Karabagh, and Russia. However Parskahayeren is unique within the Eastern group in that it rejected the reformed Abeghian orthographical conventions of Soviet Armenia in 1922, and is thus confederate with its distant Western Armenian cousin in retention of the archaic Mashtotsian orthography originally used to write Classical Armenian (Grabar). Following the Armenian Genocide of 1915, the Western subgroup is now centered in Syria, Iraq, Lebanon, Israel, Egypt, and abroad, but was once native to the highlands dotting modern-day Turkey. Armenians refer to themselves as Հայ Hay, and to Iran as Պարսկաստան Parskastan “Persia”, from Պարսիկ Parsik “a Persian”, and hence the root of the terms Պարսկական Parskakan “Persian (non-human adjective)”, Պարսկահայություն Parskahayut’yun “Iranian Armenian community”, Պարսկերեն Parskeren “Persian language”, and Պարսկահայերեն Parskahayeren “Language of the Iranian Armenians”. The link between Armenia and Persia is about as old as the foundation of the Persian Empire in the 3rd century B.C., but the modern Armenian-Iranian yoke has its genesis in the late medieval period. It should be noted that no pre-genocide Armenian colony (Գաղութ Gaghut’) has enjoyed the extent of affluence, relevance, and repute in its host society as the Armenian diaspora of Persia. Iran has served as a stage for momentous developments in Armenian matters, in certain contexts even eclipsing the territories considered to be at the core of Historical Armenia (Մեձ Հայք Medz Hayk’) in power and consequence. Khoja Petros Velijaniants’ (left) financed the St. Bethlehem Church (Սուրբ Բետղեմ Surb Betghem; كليساى بيت اللحم Kelisā-ye Bayt ol-Lahm) in Isfahan, Iran in 1628. His family opposed the rule of the Shafraz family in New Julfa, but they lost and left for Surat, India in 1638. In a strategic move against the Ottomans that was meant to evacuate Nakhchivan, in 1604-5 Shah ʿAbbās I transplanted over 60,000 Armenian families (Բռնագաղթ Brrnagaght’), many of whom perished, into the inner regions of Iran. But the Shah had a unique vision for a cohort of exceptionally skilled businessmen from the prosperous Armenian town of Julfa (Ջուղա Jugha; جلفا Jolfā) on the river Araks. Indeed among his most intriguing and rewarding schemes in statecraft was the establishment of a world-class commercial district headed by a semi-autonomous Armenian merchant oligarchy of Julfan extraction in his new capital city, Isfahan, wherefrom Iranian silk was traded for European silver. In this exclusive, custom-built trading colony called New Julfa, the Armenians lived in symbiosis with the Safavid state insofar as they were sanctioned by royal decree (فرمان farmān) to preserve their distinct cultural, linguistic and religious identity (Հայկականություն Haykakanut’yun “Armenianness”), while melding harmoniously with the sovereign Persislamic socio-political infrastructure. 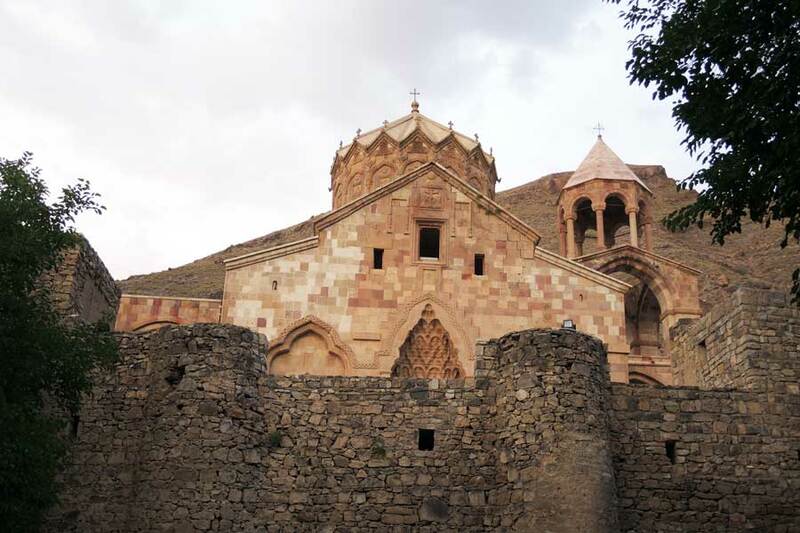 Under the patronage of Shah ʿAbbās I and his successors, who appreciated the Armenians’ talents and expertise, New Julfa soon transformed into a thriving center of craftsmanship and international trade replete with 24 churches. 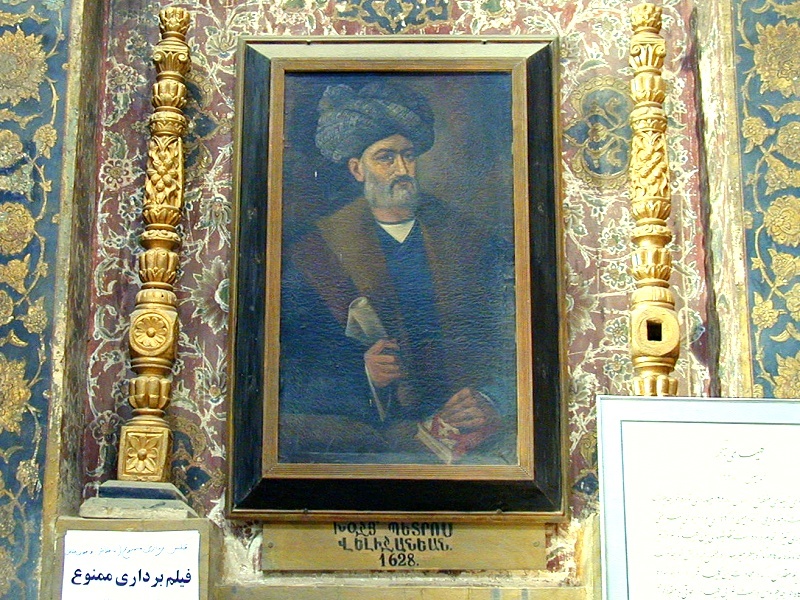 Contemporary French traveler Jean Chardin wrote that, in 1673– just two generations after the Julfan Armenians’ exodus from the Caucasus to Iran– Agha Piri, the head of the Armenian Community of Isfahan and one of its richest merchants, owned a fortune greater than 2,000,000 livres tournois (the equivalent of 1,500 kg of gold). Contrast with the textile merchants Beauvais and Amiens (the wealthiest merchants in France in the same period), the wealth of these two inventoried at their deaths amounted to 60,000 and 163,000 livres tournois respectively—a figure then considered astronomical. Yet these two figures combined amounted to barely a tenth of Agha Piri’s fortune. 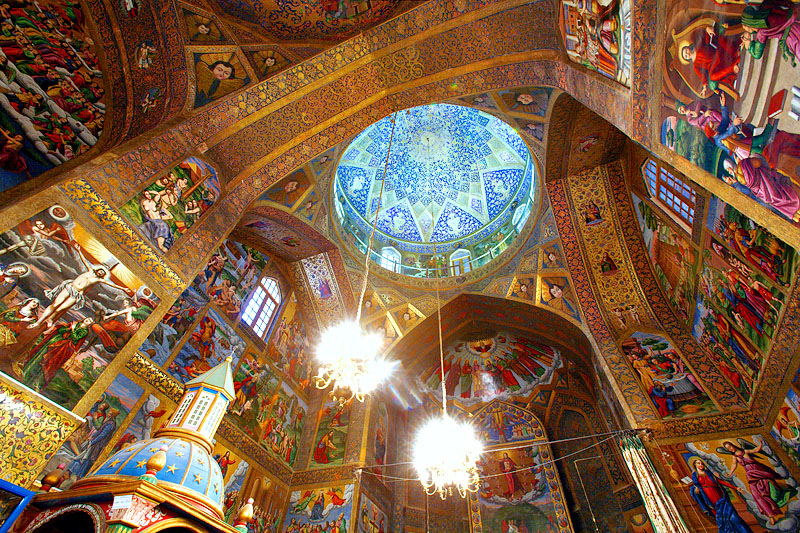 (Top) Interior of Vank Cathedral (Սուրբ Ամենափրկիչ վանք Surb Amenap’rkich’ Vank’; کلیسای وانک Kelisā-ye Vānk) completed 1664 A.D., New Julfa, Isfahan, Iran; (Bottom) New Julfa Armenian district, clocktower and museum (17th century), Isfahan, Iran. Throughout the Safavid and Qajar periods, Armenian-Iranians served as brokers on behalf of Persia in both commercial and political contexts due to their common faith with Christian Europe and familiarity with the languages and traditions of the peoples of both East and the West. The provost of New Julfa (Persian: كلانتر Kalāntar “Provost”; Armenian: Հայոց Թագավոր Hayots’ T’ak’avor, literally “King of the Armenians”) was chosen to hold official receptions of foreign embassies to Isfahan on the Allahverdi Khan bridge (later renamed Si-o-Se Pol), and the Armenians acted as a welcoming committee often introducing foreign visitors to the Safavid court. 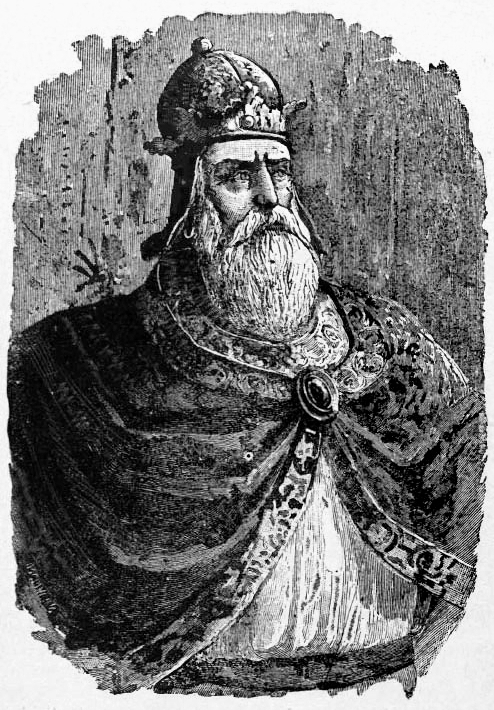 Hovhannes Vardapet, a native of New Julfa, introduced the first printing press into Persia from Italy (Գրահրատարակչություն Grahratarakch’ut’yun; چاپخانه Chāpkhāne), and the first book printed in Iran was the Armenian Saghmos (Սաղմոս “Psalms”) in 1638. In 1715, the last Safavid monarch Sultān Husayn sent an embassy consisting almost exclusively of Armenians to King Louis XIV’s court at Versailles, which resulted in the establishment of a permanent Persian consulate at the port of Marseille staffed by the Armenian “Hagopdjan de Deritchan.” Armenians continued to participate in national transformations through the Qajar period, and in 1850, Naser al-Din Shah’s chancellor Amir Kabir dispatched an Armenian, Mirza Davud, to Austria and Prussia to select six instructors in different fields for the modern polytechnic school that the chancellor was constructing, the Dār ul-Funūn (دار الفنون “House of the Arts”). Bishop Papken Tcharian, prelate of Isfahan (Սպահանի Հայոց Թեմի Առաջնորդ Spahani Hayots’ T’emi Arrachnord), leads ceremony in Surb Amenap’rkich Cathedral, New Julfa, Isfahan, Iran. The Armenian contribution to the overall configuration of the 20th-century Iranian society, both culturally and economically, is significant. Armenians were pioneers in photography, theater, and the film industry. The first movie theater to open in Iran (Tabriz, 1916) belonged to Alex Sahinyan, an Armenian who used the hall in the French mission of Tabriz as “Cinéma Soleil,” in which Russian and European films were shown to an enthusiastic audience. 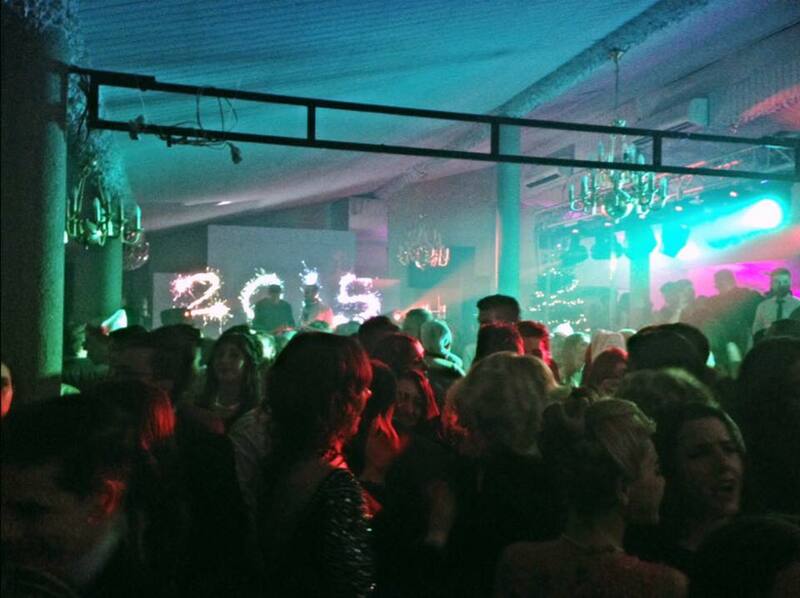 They were among the first to introduce Western music and dance to the Iranian public. The popularity of modern fast-food establishments in Iran also owes much of its original success to the daring enterprise and perseverance of the Armenian businessmen who first introduced them in the Muslim society of Iran several decades ago. Armenian athletes have represented Iran in international tournaments, particularly boxing, weightlifting, soccer, and volleyball. 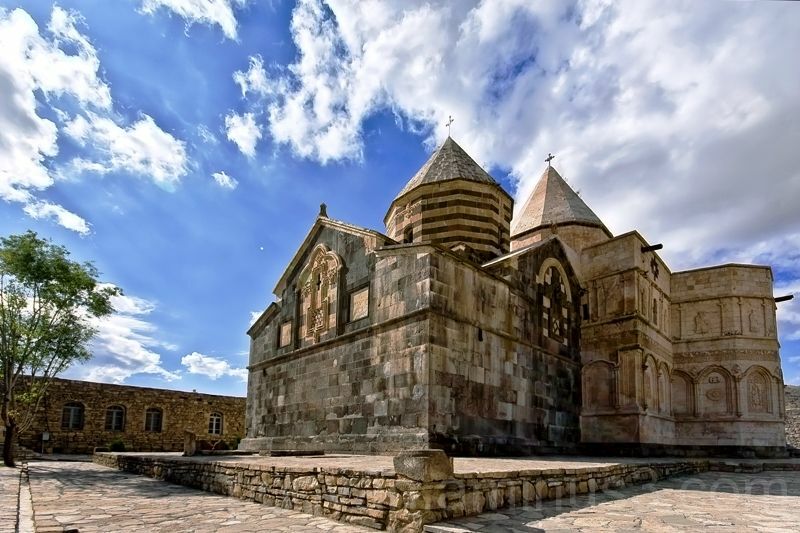 St. Thaddeus Monastery (Սուրբ Թադեոսի վանք Surb T’adevosi Vank’; قره كليسا Ghara Kelisā), Māku, Iran (1329 A.D.) In the past six centuries, more than 100 Armenian ecclesiastical structures have been commissioned in Iranian Azerbaijan, a few dozen of which are still standing today. Today Tehran is the center of gravity for Iran’s ~150,000 Armenians, although this is a fairly recent transformation. The traditional centers of Azerbaijan and Isfahan (since the 17th century) have been overshadowed in recent years by the tremendous growth of the Armenian population in Tehran, where more than 60 percent of the entire community resides (meaning approximately 80,000-100,000 souls). Large-scale migration from Azerbaijan, particularly following the Turkish invasion of that province in World War I, and emigration from Armenia proper following the Russian revolution, rapidly turned Tehran into a haven. The Armenians are designated two seats in the Iranian Parliament (مجلس Majles, Խորհրդարան Khorhrdaran), whereas Jews, Zoroastrians, and Assyrian-Chaldeans are each designated only one. 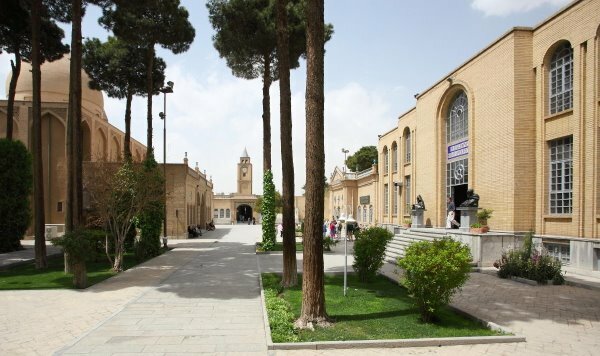 Three prelates with jurisdiction over the three district areas of Azerbaijan, Isfahan (including southern Iran and India), and Tehran (including central and eastern Iran) head the community. They were traditionally subject to the catholicos of Echmiadzin in Soviet Armenia, but for political reasons aligned themselves with the catholicos of Cilicia in Lebanon in the 1950’s. St. Sarkis Cathedral (Սուրբ Սարգիս մայր տաճար Surb Sark’is mayr tachch’ar; كليساى سركيس مقدس Kelisā-ye Sarkis-e Moghaddas), Tehran, Iran. The privileged status of Armenian is unusual in the context of the Islamic Republic, although Armenians have enjoyed unprecedented favor in a variety of contexts since their arrival to Iran in the 17th century. Quite paradoxically, Persian and Armenian are the only two languages with any official currency in today’s pluralistic Iran. Approximately 53% of Iran identifies Persian as its mother tongue, while only 0.2% speaks Armenian as a first language. 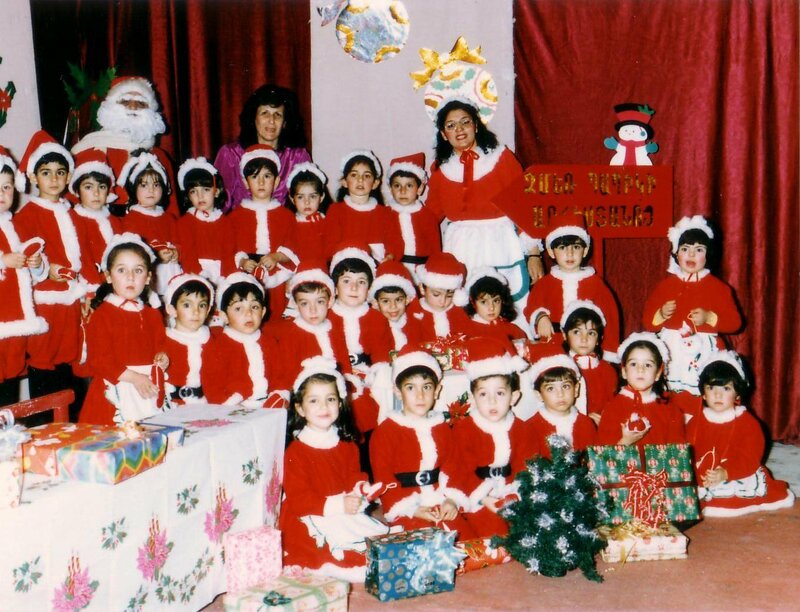 The official language of education, media, and legislation is Persian, but Armenians are lawfully entitled to their own private kindergarten-12th grade schools wherein Armenian is a primary language of instruction alongside Persian (before the 20th century reforms under Reza Shah, Persian was taught as a foreign language alongside French and English; and Russian in Azerbaijan). 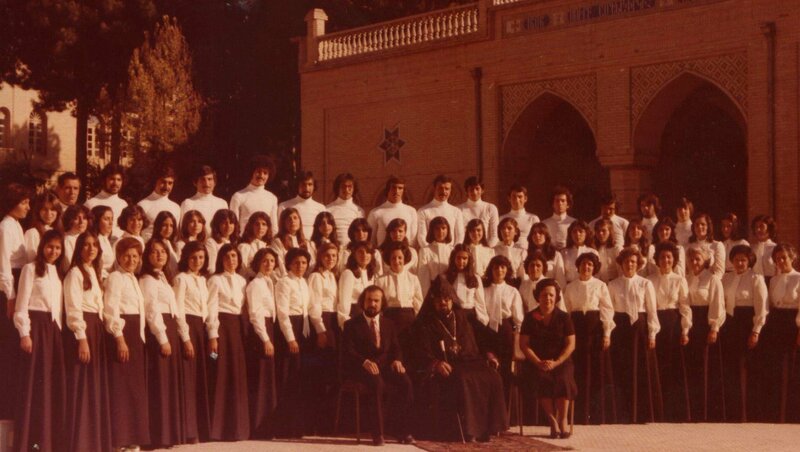 There are approximately fifty Armenian private schools scattered throughout Iran today, whence Armenian students seeking higher education must pass a standardized national competency exam (كنكور Konkūr; Կոնկուրսի քննությունը Konkursi k’nnutyunё)—which includes Persian literature and Islamic theology—in order to integrate into national Islamic universities. Armenians run their own churches, schools, philanthropic organizations, sports clubs, night clubs, cultural associations and Armenian language publications including a daily newspaper based in Tehran, Alik’ Ōrat’ert’ (Ալիք Օրաթերթ “Wave Daily Newspaper”). 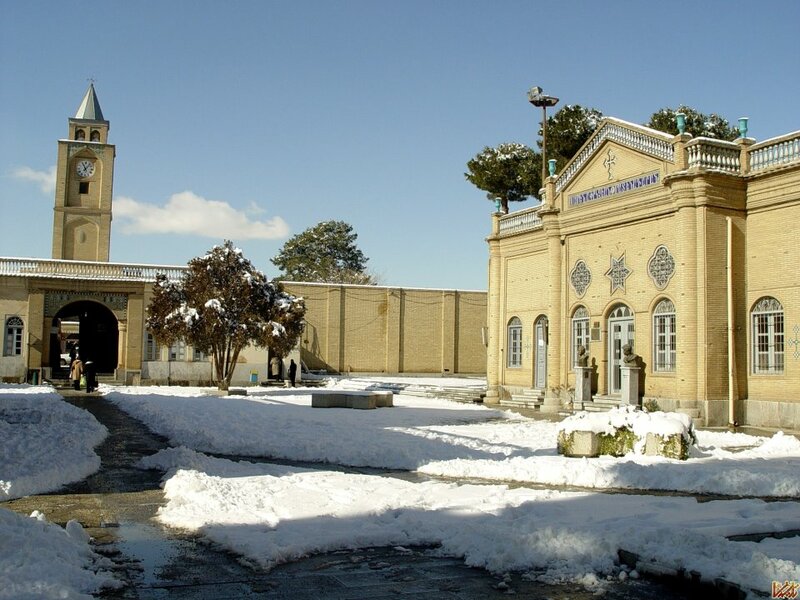 In Tehran’s northern Vanak neighborhood, the Ararat Complex (Արարատ Միություն Ararat Miut’yun; باشگاه آرارات Bāshgāh-e Ārārāt) is a barbed-wire walled and gated, 20-acre cultural and sports complex that only Armenians are allowed to enter (by government order), and wherein patrons are exempt from the Islamic guidelines governing inter-gender public interaction, including dress code (hejāb), and alcohol is legally consumed on the premise. Nationalist factions among Iran’s Azeris (16%), Kurds (10%), Arabs (2%), Turkmen (2%) and other ethnolinguistic minorities toil vigorously with the issues of language policy and cultural oppression, but they seem wholeheartedly unaware of the status of Armenian. 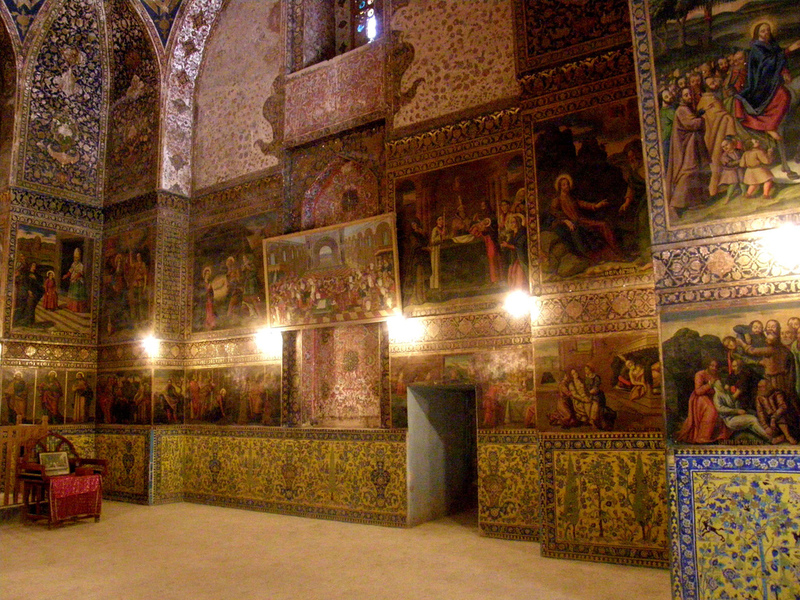 Perhaps this is due to their geographic location at the periphery of Iran and subsequent disconnect from the happenings of Armenian-inhabited urban centers (except in the case of Azerbaijan), or retained traditionalism in the long-standing belief that Christians can never be truly Iranian and thus constitute a quasi-foreign element in Iranian society. Persian and Armenian are genetically related languages. Pre-Armenian, Pre-Albanian, Pre-Phrygian, and Pre-Greek split off with PIE transhumance into the Balkans (and thence Anatolia, in the case of Armenian), but their origins are conflicting and their affinities with each other are problematic for a number of reasons that are outside the scope of this article (such as incongruities in Satemization and Centum superstrate; see Middle Dnieper multi-ethnic “vortex” culture for more reading). The second link is cultural, as manifested in the form of several hundred loanwords borrowed from Old Iranian (Old Persian, Median, Avestan), Middle Iranian (Parthian, Middle Persian, Manichaean Parthian) into Classical Armenian, and to a far lesser extent, Modern Persian into Modern Eastern Armenian . The degree of Iranian borrowing throughout all registers of the language is so profuse that in the mid-19th century experts both in Armenian and in Iranian, foremost among whom were Paul de Lagarde and F. Müller, concluded that Armenian belongs to the Iranian group of Indo-European languages. That opinion prevailed until 1875, when H. Hübschmann pioneered a methodological principle whereby Iranian borrowings were separated in chronological layers from an Armenian core. That is to say, Old and Middle Iranian borrowings have effectively entered the ‘core’ of the Armenian language from the ‘periphery’, in that they have long since ceased to be perceived as loanwords and have become nativized phonologically. Analogously, the vast majority of loans are not readily recognizable to speakers of Modern Persian—in essence rendering this second linkage inoperative in the joint social memory of Iranians and Armenians. Although Zoroastrianism was the predominant religion among Armenians for nearly 800 years before Christianization, conditions favorable to a fruitful cultural interchange between Armenians and Iranians existed almost exclusively during the rule of the Parthian (Iranian) Arsacids over Armenia (Արշակունիների արքայատոհմ Arshakunineri ark’ayatohm; سلسله اشكانيان Selsele-ye Ashkāniān). During that period the culture of the Parthian feudal aristocracy, being superior to that of the Armenians, exerted profound influence on the highlands. Accordingly, most of the linguistic borrowings came into Armenian from the Northwest Iranian language of the Parthians in a way comparable to the overwhelming French influence on English after the Norman conquest, although there are significant contributions from Southwest Iranian during the Sassanian period. 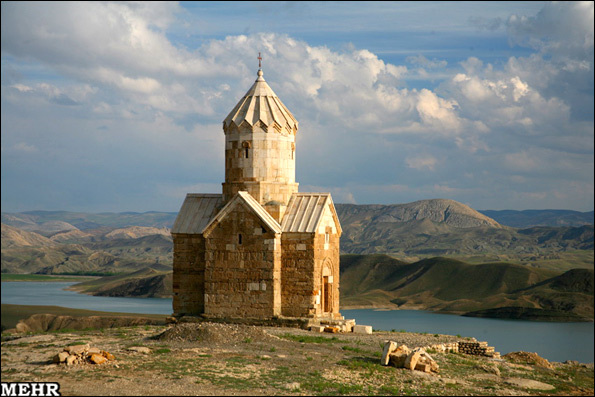 The Church of the Holy Cross at Aghtamar (Աղթամարի Սուրբ Խաչ եկեղեցի Aght’amari Surb Khach yekeghets’i), Lake Van, is based on ideas of 7th century Armenian architecture but the sculpture program is novel. The southwest façade (Top) features a sculpted scene of Jonah and the Whale in which the whale looks conspicuously like the Iranian mythological bird Simorgh (Middle Persian: senmurw → Armenian սիրամարգ siramarg “peacock”). The cross-legged figure on cushions draws from Islamic tradition. 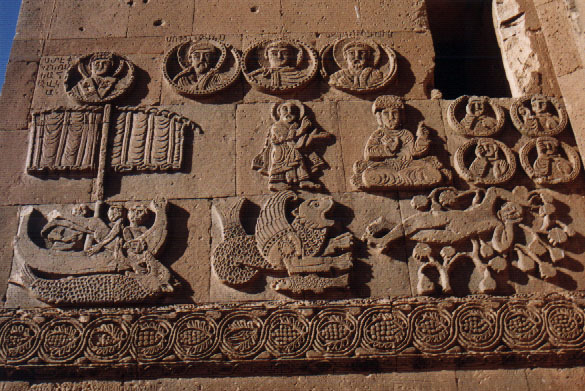 On the western façade (bottom right), Prince Gagik, commissioner of the Church, is depicted presenting a 3-dimensional model of the Aghtamar Church to Christ; Gagik is depicted taller than Christ and wearing a silk cloak with birds in randles—reminiscent of Sassanian silks (bottom left). As late as the 11th century, Aghtamar draws on Iranian signs of kingship and authority. Nevertheless, the breadth of Iranian contributions to the Armenian stock has not been paid adequate attention in Armenian historiography. The reluctance of Armenians to acknowledge the contributions of the pre-Islamic but still inextricably Iranian world to their language, traditions, and material productions, and subsequent preference for the blanket term “pagan” (հեթանոսություն het’anosut’yun) in dealing with pre-Christian matters, has three causes. First, traditionalist and secular but still Armenochristian intelligentsia remain sensitive to the long standing history of massacre and subjugation, often but not always in the context of being a Christian minority in a Muslim society. The popularization of the term “pagan” in place of “Zoroastrian”, “Parthian”, “Persian”, “Iranian” or “Mithraist” accomplishes the goal of distancing the Republic of Armenia’s national heritage from the cultural property claimed by the neighboring Persislamic political apparatus. 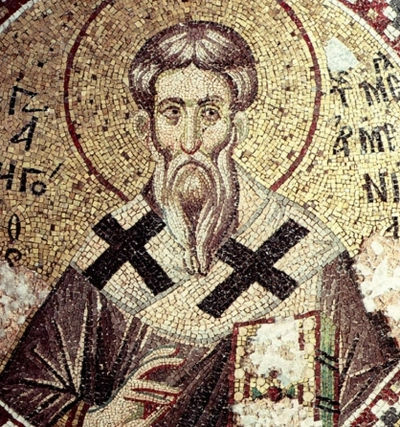 Second, the term “pagan” is reinforced by its currency in Christian doctrine and clerical texts; notwithstanding, the Iranianisms in the Armenian stock seem to be selectively trivialized, even vis-à-vis the more remote Urartian or Ancient Greek contributions. Finally, there exists a pervasive essentialist attitude among intellectuals and laypeople alike that any non-Christian agent in the Armenian national narrative cannot be truly “Armenian”—as according to prevalent social ideals—and thus constitutes a quasi-foreign element in the otherwise continuous chronicle of a supposedly homogeneous people. 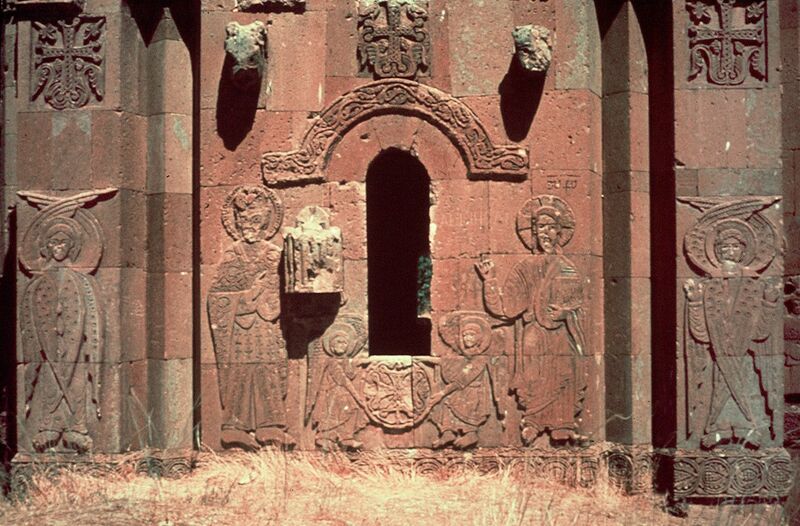 According to Armenia’s folk conversion story, Gregory the Illuminator (top left; Գրիգոր Լուսավորիչ Grigor Lusavorich) was a Parthian (Iranian) Christian priest responsible for converting the Parthian (Iranian) king of Armenia, Tiridates III (top right; Տրդատ Արշակունի Trdat Arshakuni), to Christianity. Khor Virap monastery (bottom) in Ararat province, Armenia, marks the setting of these developments. 1. Help determine the exact phonetic shape of the (Middle) Iranian words, which in the Iranian texts is often obscured by the consonantal writing systems. The Armenian alphabet, however, is fully vocalized, though it does not show the original vowel quantity. 2. Enable us to establish the exact meaning of the Iranian words. 3. Shed light on the phonetic developments that took place in the Iranian languages and thus aid in reconstructing linguistic stages not known or not sufficiently known from the Iranian evidence itself. 4. Provide evidence relating to Iranian, and especially Middle Iranian dialectological problems. 5. Finally, the Armenian language is also an important source for Iranian lexicology and lexicography as it contains many words, some of which survive right down to the present day, not attested in the Iranian languages themselves. Thus Armenian serves as a sort of fossil record to linguists for exploring Iranian paradigms that are often abstract and even innovative. from Middle Persian šnwhl ‎(šnōhr, “gratitude, contentment”). Compare Manichaean Parthian ʿšnwhr ‎(išnōhr, “grace; gratitude”), Avestan ‎(xšnaoϑra-, “satisfaction”). from Iranian *-yān, a postvocalic variant of the pluralization suffix *-ān, whence -ան ‎(-an). from Iranian; Compare Middle Persian dwšʾwl ‎(*dušwār, “difficult, disagreeable”), Persian دشوار ‎(dušvār). from Middle Persian *vitang, from Old Persian *vitanka-‎(“hardship, peril, misfortune”), composed of the preverb *vi- ‎(“down”) and the root *tanč- ‎(“to twist (together), become narrow, dense, constrict”). from Iranian *nikar. 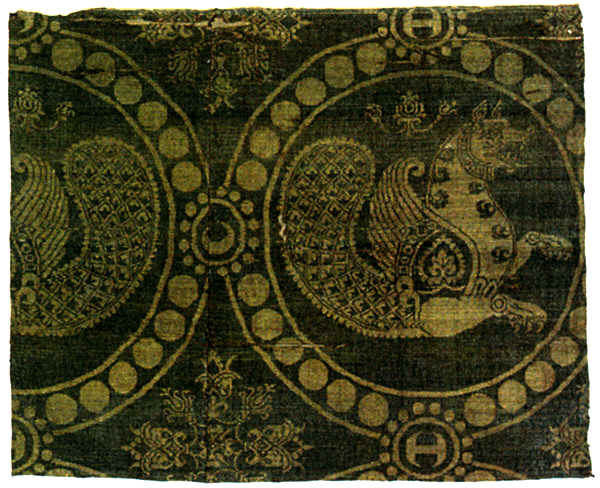 Compare Manichaean Middle Persian ngʾr ‎(nigār, “painting, picture”), Persian نگار ‎(nigār). An Iranian borrowing. Compare Middle Persian cšm dyt’‎(čašmdīd, “visible, obvious”, literally “seen with (one’s own) eyes”). from Parthian *Varhraγn; ultimately from Avestan ‎(Vərəθraγna, “Verethragna”, literally “smiting of resistance, breaking of defence; victory”). Related to Avestan (vərəθra, “shield, obstacle, defensive power”). All ultimately stemming from Proto-Indo-Iranian *Hurtra-‎(“cover”). from Middle Iranian *pēs. Ultimately from Proto-Indo-European *peyḱ-. from Iranian *nimān, composed of the prefix ni- and the root mān-. Compare, Persian مانا ‎(mānā, “alike, equal, resembling”). The Temple of Garni (Գառնիի հեթանոսական տաճար Garrni het’anosakan tachch’ar), Kotayk Province, Armenia. Commissioned by the Parthian (Iranian) king of Armenia, Tiridates I, some scholars ascribe this Greco-Roman colonnaded structure to the Iranian deity Mithra (Միհր Mihr), who was a member of the Irano-Zoroastrian pantheon of pre-Christian Armenia (the Trinity: 1. Aramazd < from Ahura Mazda; 2. Mihr < from Mithra; 3. Anahit < from Anahita). (August 2015, Photo by Afsheen Sharifzadeh). As in the case of Québécois French in Montreal, Armenian-Iranians within a single city seem to speak a variety of dialects that differ appreciably from each other in lexicon, pronunciation and sometimes morphology. This can be attributed to the diverse provenance of Armenians inhabiting Iran’s major urban centers—some tracing their roots to Iranian Azerbaijan (Ատրպատական Atrpatakan) particularly Tabriz (Դավրեժ Davrezh or Թավրիզ T’avriz), Urmia, Salmas, Khoy, and Maragha and its surroundings; Kermanshah and Hamedan; Ardebil and Rasht; New Julfa (Նոր Ջուղա Nor Jugha) in Isfahan (Սպահան Spahan) and Arak; Shiraz; Abadan and Ahwaz; or to a number of Armenian villages scattered throughout central Iran, including Fereydan region (Փերիա P’eria) and Bourvari. Yet wholesale emigration of some Iranian Armenian villages to Russia in the late 1940s after the catholicos of Soviet Armenia pleaded to all the faithful to repopulate the ancestral homeland devastated by World War II, famine, and the post-revolutionary atrocities in Russia, still greatly reduced their diversity and numbers. Dialect in Tehran is also delineated along socio-economic lines—although this might be a residual geographic feature—as well as the extent of an individual’s exposure to the post-Soviet Republic of Armenia. Nonetheless, there are a few overarching features of Parskahayeren as encountered in Tehran that have been selected for discussion below. An Armenian delegation visits the Armenian diaspora community of New Julfa, Isfahan, Iran. Due to bilingualism and areal features, Iranian Armenian dialects bare typological resemblances to modern Persian, but still markedly less so than other languages spoken in the country (except perhaps the Georgian dialect of Fereydan). Pronunciation is a highly distinguishing feature of Iranian Armenian vis-à-vis the Eastern Armenian dialects encountered in the former U.S.S.R. In general, intonation, rhythm and cadence tend to echo Modern Persian—in turn constituting a major deviation from the Caucasian variety, which parallels those features of Russian. For example, the final syllable of interrogative clauses are elongated in the exaggerated manner of Persian and Azeri. The vowel ա “a“ is pronounced like Persian آ “â”, whereas in Yerevan the same vowel is rounded in the manner of Russian “ä“. In general, prosody is used to convey emotions according to the Persian canons; a phenomenon which accounts for the alleged “sing-songy” feel of Parskahayeren according to Caucasian speakers. However, there are still a number of distinct prosodic paradigms in Persian and Parskahayeren that in turn afford the languages quite unique aesthetic qualities. Notably, speakers of Parkshayeren tend to employ creaky voice. Additionally, Iranian Armenian has preserved the Classical alveolar approximant pronunciation of Ր “r”, (which corresponds to the Standard American English pronunciation of “r”); whereas other Eastern and Western Armenian dialects have shifted to alveolar flap [ɾ] (corresponding to the Scottish English pronunciation of “r”). In perfective constructions wherein the verb is not followed by a modifier, the infinitive final -լ -l is dropped: Tehran Vortegh es tsnvé? for Yerevan Ur es tsnvel? “Where were you born?” When the verb is followed by a modifier, Tehran often has -r- final: Tehran eker er for Yerevan yekel er “S/he had come.” In this sense Parskahayeren pronunciation is both archaic and innovative. The “Father of Iranian pop music”, Vigen Derderian (Վիգեն Դերդերյան, ويگن دردريان), and his daughter, singer and songwriter Jaklin. Vigen was born into the Armenian community of Hamedan; Jaklin was born and raised in the Armenian community of Tehran. The Iranian-Armenians are bilingual, although the Tabriz and Urmia communities (Թավրիզ ու Ուրմիայի Հայ համայնքը T’avriz u Urmiayi Hay hamaynk’ё) seem to be operationally trilingual in Armenian, Azeri, and Persian. Bilingualism in the case of fast-paced, trendy Tehran has paved the way for a great deal of language-mixing—primarily whereby an Armenian-speaking informant substitutes Persian words in place of their Armenian equivalents. However, the degree of this phenomenon is dependent on the informant and by no means approaches the threshold of creolization. Wholesale substitution takes precedence over calques in the case of Tehrani Persian slang and in registers for which Armenian has no equivalent. Wholesale substitution of Armenian words is present in the vernaculars of both Tehran and Yerevan, however markedly more so in the latter. Otherwise, the Tehran vernacular is more conservative in her lexicon compared to the Yerevan vernacular, save a few idiosyncrasies: Tehran esi and eti, etikё for Standard սա sa “this” դա da “that”; Tehran sté, stegh and ёndé, ёndegh for Standard այստեղ aystegh “here” and այնտեղ ayntegh “there”; Tehran bidi for Standard պետք ե petk’e “must, should”; Tehran esents‘ for Yerevan stents’, nents’ and Standard այսպես ayspes “this way, like this”; Tehran որտեղ vortegh for Yerevan ուր ur “where”; Tehran ira, iran, irank’, irants’ for Yerevan nra, nran, nrank’, nrants’ “his/her, to him/her, they, their”. The issue of Parskahayeren mähät/mät “one; a piece; a little; a moment; a bit; etc.” is discussed below. Iranian-Armenian artist Helen (née Matevosian) sings Garun Yekav (Գարուն Եկավ “Spring Came”), a winner at the 2007 Armenian Golden Star Awards. “What’s up?/What’s new?” Inch khabar? Tehran կարողանալ karoghanal + conj. subjunctive verb (parallel to Western Persian construction) for Yerevan karoghanal + infinite verb “to be able to do [something]”; Չեմ կարող ասեմ Chem karogh asem for Yerevan Չեմ կարող ասել Chem karogh asel “I cannot say”, among many other examples. “What’s happened?” Ինչ ա ելե? Inch a elé? Ինչ ե եղել? “Why didn’t he give you an apple?” Հեր քեզի խնձոր չտվավ? Her k’ezi khndzor ch’tvav? Ինչու քեզ խնձոր չտվեց?